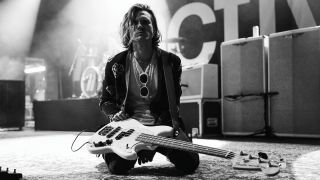 The band Ink, stylised as INK., bless ’em, is a trio made up of bassist Dougie Poynter, vocalist Todd Dorigo and drummer Corey Alexander. They’ve just released a debut EP, Heaven, which you should check out if you’re into rock of the dark, atmospheric kind. Poynter, a thoroughly likeable fellow, has a stadium-sized CV with youthful punk types McFly and a supergroup of similar ilk called McBusted, winning the reality show I’m A Celebrity… Get Me Out Of Here! in 2011 and acting in films here and there. Let’s have a word with him. Dan’s a rock guy, so given the dark nature of the new EP, it makes sense. What are the basses this time? “The Music Man Sterling is my absolute go-to instrument and has been for years now. I have them all; there’s the single H, the HS and the HH variants. Each song by Ink features a different bass, and one song has two different basses. There’s a Sterling in drop-D which runs through a weird analogue pedal that we found, for example. What is it that you like about Sterlings? What amps do you use? How did you get into bass? Who influenced you on bass? Are McFly on hiatus at the moment? Congratulations on being the only bassist to win a reality TV show, as far as we know. 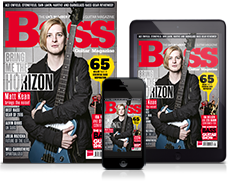 Did you buy a load of cool bass gear with the winnings? Heaven is out now on Black Ink Records.